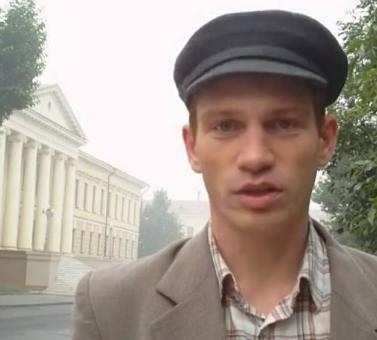 Vadim Tyumentsev has been under arrest since April 28, 2015. At present a trial in his case is taking place. He is charged under part 2, article 280 (Public calls for extremism with the use of the internet, up to five years in prison), and under Article 282 (Section 1) (Inciting hatred or enmity, and also insulting the dignity of a person or group of people on the basis of their ethnicity or heritage, up to four years in prison). In the first clip the blogger called on the people of Tomsk to come out for an unauthorised action as a sign of protest against increased prices for riding on minibuses and a decline in the safety of travel. He called the leaders of the city and oblast corrupt and said they were lobbyists. In the second clip Tyumentsev expresses a protest against the fact that refugees and displaced persons from Donetsk and Luhansk Oblast are coming to Tomsk Oblast. He blames them for the armed conflict in their region and for betraying Ukraine, and demands their deportation using offensive language. From our point of view, within the current legislation in this case we can even theoretically talk only about the use of article 282 and only for the clip “Residents of Donetsk and Luhansk Oblast – out of Tomsk!” At the same time we in no way wish to claim that Tyumentsev should be found guilty in this case: this should be the subject of an honest legal investigation. We will not reject Tyumentsev for recognition as a political prisoner despite the debatable content of his statement, since there is no direct call for violence in it. We find the prosecution for the clip “Day of people’s anger in Tomsk against lawlessness of officials and minibus drivers” to be completely unjustified and associated exclusively with the expression of an opinion and non-violent action. Calls to participate in an unauthorised demonstration and peacefully block roads do not come under the list of extremist actions, but and limits of allowable criticism of officials and professional politicians is broader than that of other citizens. Thus the extent of the charge on this is being inflated artificially. The charges under articles 280 and 282 are based on the same arguments, from which a double punishment results for one and the same action. We are compelled to point out that Tyumentsev’s right to a defence has been restricted. His interests are being represented by a lawyer appointed by the court. At the same time the court rejected two people at once who wanted to become Tyumentsev’s public defenders for no charge. At the same time a signature on non-disclosure was taken from the lawyer. In our view, the restriction on reporting this trial is unfounded. We demand an end to the prosecution of Tyumentsev for the clip “Day of people’s anger in Tomsk against lawlessness of officials and minibus drivers” and a guarantee of a fair investigation with a charge only under one article of the Criminal Code in connection with the clip “Residents of Donetsk and Luhansk Oblast – out of Tomsk!” We consider holding him in custody incommensurate with the public danger of the actions of which he is accused. We believe that the trial should be held openly with the involvement of public defenders. Recognising a person as a political prisoner does not mean that the Memorial human rights centre agrees with the views of statements of the person recognised as a political prisoner, or that it approves of their statements or actions. More details with information about the case of Vadim Tyumentsev and the position of theMemorial human rights centre can be found on our website.